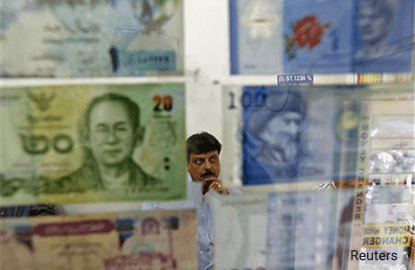 (April 10): All Asian currencies besides the Philippine peso were weaker on Monday as heightened geopolitical tension weighed on investor sentiment, turning their focus towards safe assets. The Korean won, down 0.67%, fell for a fifth straight session and was the biggest loser in the region. The won, which has weakened on growing concerns over North Korea's weapons programme, was further dented after a US official said a US Navy strike group will be moving toward the Korean peninsula as a show of force. "The KRW (won) looks susceptible to further losses, especially if geopolitical tensions escalate," ANZ said in a note. The US Navy move comes after the United States last week struck a Syrian air base in retaliation for a Syrian chemical weapons attack, triggering a rally in safe haven assets and pushing up oil prices. Asian stocks excluding Japan also slipped in the risk-off environment, falling on Monday for a third consecutive session. The Taiwan dollar fell for a seventh day against the US dollar, while the Singapore dollar, down 0.23%, saw its fifth straight session of losses. The US dollar, which rose 0.1% to a three-week high, was bolstered by a key US Federal Reserve official reinforcing the central bank's commitment to raising interest rates. Major US indexes, however, closed lower after a key jobs report on Friday showed the economy only added 98,000 jobs in March, well below economists' expectation of 180,000. The Philippine peso bucked the trend by rising on strong net inflows to the Philippine equity market during the past week. The peso was up 0.65% against the US dollar to its highest since early February. "The rise of inflows is likely due to temporarily eased concerns about political instability," said Amy Yuan Zhuang, Nordea Markets' chief analyst. "Investors are looking past [President Rodrigo] Duterte's controversial statements and are instead focusing on what he might achieve on the economic agenda." Thousands have died in Duterte's controversial war on drugs which and his incendiary tirades against some world leaders and international regulatory bodies have added to uncertainty in the Philippines' political sphere.